The California startup began delivery in April. It is using intelligent machines to grab a slice of the multibillion-dollar pizza delivery market. Zume is one of a growing number of food-tech firms. They are seeking to disrupt the restaurant industry with software and robots. "We're going to eliminate boring, repetitive, dangerous jobs. And we're going to free up people to do things that are higher value," said co-founder Alex Garden. He is a former Microsoft manager and president of mobile game maker Zynga Studios. Inside its commercial kitchen in Mountain View, pizza dough travels down a conveyer belt. Machines add the sauce, spread it and carefully slide the uncooked pies into an 800-degree oven. 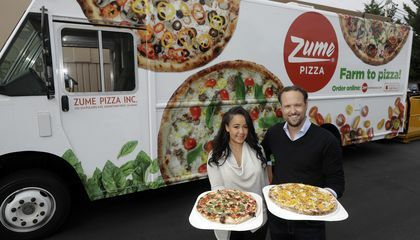 Zume also wants to bring innovation to pizza delivery. This fall, the startup plans to deploy trucks equipped with 56 ovens. These can bake pizzas en route to customers, allowing them to deliver dozens of orders before returning to the kitchen. I would not trust a robot to make my food because technology has been known to make mistakes, and do not want one of those mistakes in my food. I would eat a pizza made by a robot any day. Pizza is always good and a robot can get it to me in half the time. As long as the pizza is safe It seems like a perfect idea. To get that delicious pizza. 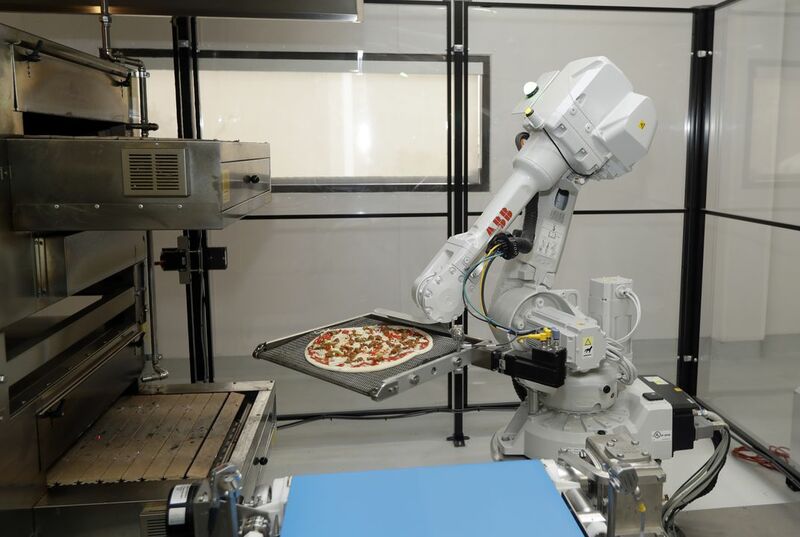 This is a great idea, robots making pizza. I love pizza, no matter who makes it. As long as it's good and doesn't have extra things in it that pizza shouldn't have, It's all good. I like the idea of people not having to do manual labor but... Is that not what a job is for? You get payed for a reason. If people start this robot idea in a lot of places and ways, a lot of people could loose paying jobs. Having a robot is cool and useful, but not in this type of field. it will still help people. In response to eating a pizza made by a robot, yes I would eat the pizza. One reason I would eat the pizza is because it is cheaper for the robot than for workers and the pizza place can use the extra money for better quality ingredients. Another reason is it is much faster for a machine to do the work so your pizza will come much faster and you don't have to wait a long time for the pizza. It says in the article " The company is trying to shorten delivery times with software." The third reason is the machines will prevent the workers from getting injured on the job and messing up the pizza because of their injury. Even thought the machine will take over some of the jobs at the pizza place I still think that I would eat the pizza even if it's from a robot and not hand made.